Prepare yourself and meet the challenge of a saliva swab test with Ultra Wash Toxin-cleansing mouthwash. Prepare yourself and meet the challenge of a saliva swab test. Ultra Wash Toxin-cleansing mouthwash achieves toxin free saliva for up to up to one half hour. 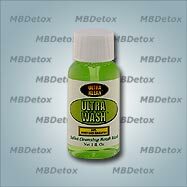 A reliable companion, Ultra Wash fits in your pocket easily and is always ready for use. Simply use a few minutes before submitting your sample - just shake, swish, and spit! The only solution for random saliva testing! Swish half of 1-oz mouthwash in mouth for 2-3 minutes. Spit out remaining mouthwash. DO NOT SWALLOW THIS PRODUCT. Repeat previous step with remaining of mouthwash (minimum of 2 minutes) - just in 10 minutes before your personal deadline. To help your body's natural detoxification and achieve total purity try Premium Detox 7 Day Comprehensive Cleansing Program.